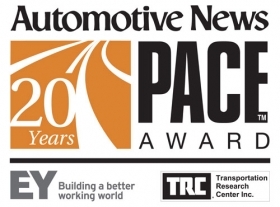 Auto suppliers have until Aug. 30 to apply for the 2014 Automotive News PACE Awards. The awards, now in their 20th year, recognize innovation. J Ferron, director of judging for the PACE Awards, says companies should create a culture that listens for ideas from anyone in the organization. And good ideas, once identified, should be put on a fast track. "Successful innovators sustain a strong sense of market urgency while always retaining a critical mass of engineering talent," Ferron says. Ferron says success often depends on whether a supplier has what he calls the torchbearer. His or her job is to seek innovations in the company, shepherd them through internal development and interact with potential customers at automakers. Management must grant the torchbearer wide-ranging access -- often outside traditional lines of authority -- to engineers, marketers and top management, he says. Finalists will be announced Oct. 12. Awards are granted in three areas: products, manufacturing processes and information technology-enabled changes. Judges will conduct site visits to the finalists to assess innovations' market impact, technological achievement and effect on the companies and their customers. PACE stands for Premier Automotive Suppliers' Contribution to Excellence. In addition to the PACE Awards, the judges grant awards to automakers for exemplary collaboration with suppliers. Winners will be announced at a ceremony kicking off SAE Week April 7 in Detroit.